What are you lookin’ at? You never seen a fox before? Isn’t this a pity? It’s bad enough I was shot, but stuffed? What is the world coming to? I was running along, minding my own business when I caught a delightful smell drifting on the breeze. I sniffed one of the most beautiful scents in creation–chicken feathers! My heart leaped! I hadn’t eaten for a few days and my stomach lurched at the thought of this fine delicacy. I followed the scent and of course it wasn’t an easy wild brood of fowl, but a penned up bunch. The old farmer had built what he thought was an impenetrable coop for his prize hens, but I’ve snagged a few of these tasty fowl in my time. I waited till almost dark, and dug under the fence. The fearful ladies started to squawk and that was my downfall. The old farmer came up to the pen just as I was chomping down on my dinner-to-be. Bang, that was it. 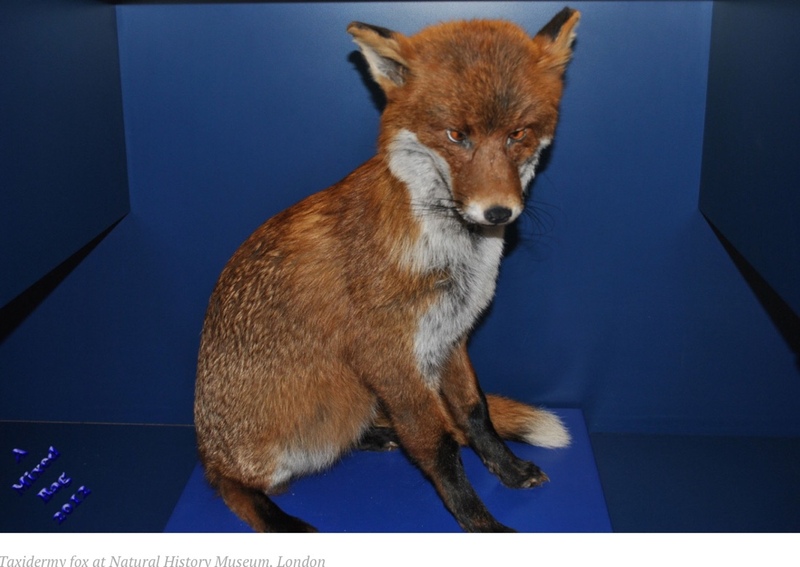 Now I’m sitting here in this box, on display so everyone can see how I outfoxed myself! I never understood ‘trophy hunters’ or people who wanted their kills mounted and stuffed. I say, hunt if you like to hunt, but eat what you kill, use what you can, and get rid of the rest. That’s the best way to honor the animal. So unless someone tells me fox meat is delicious, they’re safe from me! One snowy night while driving home about 30 years ago. With snow piled high at the sides of the road from the ploughs [plows]. Coming toward me in the headlight’s eerie glow, was a coyote, with a big hen in it’s mouth. It kept coming and I swerved to other side of the road, to let it pass, into the night. We had a fox family near us in CO. I couldn’t get in the wooded area to see them, but my husband took the grandkids. The little ones liked hunting for frogs! Doesn’t sound like the coyote was the least bit intimidated. They’ve become a danger in some states, going into backyards.